Now offering Laser Cataract Surgery! We are excited to offer LASER ASSISTED CATARACT SURGERY using the LENSAR Cataract Laser System. Technological advancements provided by the laser enable our surgeons to use Augmented RealityTM, a unique mapping system that produces a sophisticated, 3-D view of your eye to help plan and treat your cataract. Our surgeons use this technology to offer you a better, more precise cataract treatment that is customized to your eye’s own unique size and shape. A cataract is a common condition that causes a clouding of the eye’s natural lens, affecting millions of people each year, including more than half of all Americans over the age of 65. Cataracts cause a progressive, painless loss of vision, which is the result of a buildup of protein in the lens. The lens clouds naturally as we age, causing a gradual reduction of vision. The exact cause of cataracts is unknown, although it may be the result of injury, certain medications, illnesses (such as diabetes), prolonged exposure to ultraviolet light and smoking. Your doctor may perform a series of tests in order to diagnose a cataract. A dilated eye exam will be performed to test the vision and to examine the condition of the lens and other parts of the eye. Your doctor may also perform tonometry, a procedure that measures the pressure in the eye. If visual impairment begins to interfere with your ability to read, work or do the things you enjoy, you may want to consider cataract surgery to restore your vision. Cataract surgery is the most commonly performed surgical procedure in the US, and can be performed quickly and easily with a success rate of over 90 percent and a minimal risk of complications. 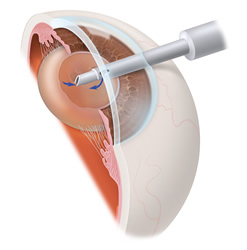 Cataract surgery is a minimally invasive procedure that involves numbing the eyes with anesthesia and then making a tiny incision into which an ultrasonic probe is inserted. The probe breaks up, or emulsifies, the cloudy lens into tiny pieces and then suctions them out of the eye. Once the cloudy lens has been removed, a new artificial lens is implanted into the eye. This lens is known as an intraocular lens (IOL), and is typically inserted through the same incision from which the old lens was removed. Surgery usually takes only a few minutes to perform and is painless for most patients. After the procedure, a patch may be placed over the eye and you will be asked to rest for a while. Patients can return home the very same day, but will need someone to drive them home. For the next few days, you may experience itching, mild discomfort, fluid discharge and sensitivity to light and touch. Your doctor will prescribe eye drops to help the healing process and to reduce the risk of infection. There are several different IOLs available to help each patient achieve the best possible results from his/her cataract surgery. 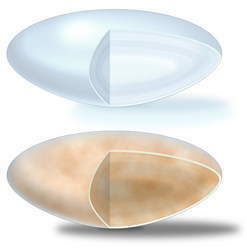 Multifocal IOLs allow for full vision correction at near, intermediate and far distances, completely eliminating the need for eyeglasses or contact lenses in most patients. Some IOLs can also correct astigmatism. These choices were not always available for cataract patients. In the past, cataract surgery only involved monofocal lenses, which could only focus on objects near or far, but could not adjust to accommodate varying distances. These patients still had to rely on glasses or contact lenses after surgery in order to see clearly at all distances, especially in older patients suffering from presbyopia. If left untreated, cataracts will worsen over time and may lead to permanent vision loss or even blindness. It is important to see your eye doctor regularly in order to detect cataracts as early as possible and to plan an effective treatment method. Although cataract surgery is considered safe, there are certain risks associated with any surgery. Some of these risks may include pain, infection, swelling and bleeding. Most patients undergo this procedure without any complications. 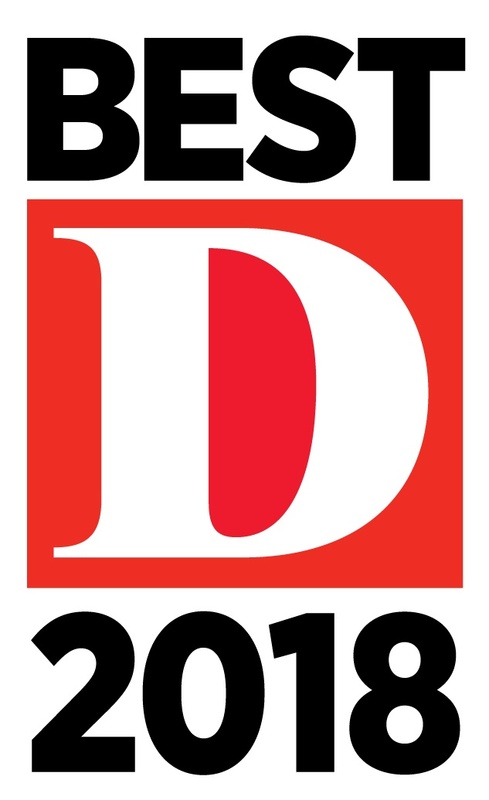 © 2019 Total Eye Care and MedNet Technologies, Inc. All Rights Reserved.